This research is motivated by observations that the noise radiated from plumes of liftoff vehicles is very intense. 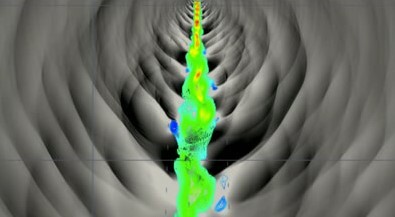 The CAVS research team employs a hybrid acoustic technique, in which the Navier-Stokes equations in the acoustic region is coupled with a non-linear Euler solver for acoustic propagation. The source term in the Euler equations is input using a penalization technique. 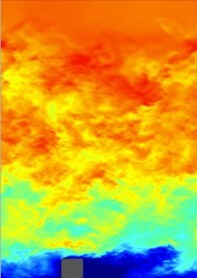 In collaboration with Tohoku University, CAVS seeks to utilize very large eddy simulations and stochastic modeling to approximate the acoustic spectra at the level of direct numerical simulation, where the LES accounts for low frequency noise, while the stochastic model provides the high frequency content. Based on wall transpiration, deformation and cooling, various control strategies are utilized to reduce the energy of boundary layer streaks, and to ultimately minimize the skin friction drag. CAVS is developing novel synthetic turbulence methods based on superpositions of distorted Hill’s vortices, aimed at imposing realistic turbulent inflow condition for LES and DNS. We are also using forcing sources to develop precursor LES methods for turbulent boundary layers. Sescu, A., Taoudi, L. and Afsar, M. (2017) Iterative control of Gortler vortices via local wall deformations, Theoretical and Computational Fluids Dynamics, DOI: 10.1007/s00162-017-0440-2. Sassanis, V., Sescu, A., Collins, E.M., Harris, R. and Luke, A.E. (2017) A Hybrid Approach for Nonlinear Computational Aeroacoustics Predictions, International Journal for Computational Fluid Dynamics, Vol. 31, pp. 1-20. 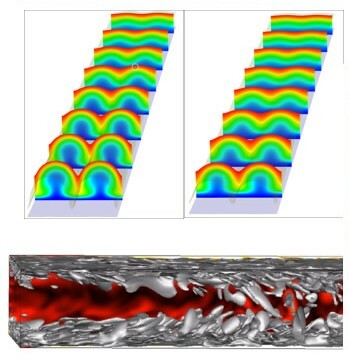 Goldstein, M., Sescu, A., Duck, P. and Choudhari, M. (2016) Nonlinear wakes behind a row of elongated roughness elements, Journal of Fluid Mechanics, Vol. 796, pp. 516-557. Harris, R., Collins, E.M., Luke, A.E., Sescu, A., Strutzenberg, L.L. and West, J.S. (2016) Coupled Overset Unstructured Discontinuous Galerkin Method for Launch Environment Acoustics Prediction, AIAA Journal, Vol. 54, pp. 1932-1952. Sescu, A. and Thompson, D. (2015) On the Excitation of Gortler Vortices by Distributed Roughness Elements, Theoretical and Computational Fluids Dynamics, Vol. 29, pp. 67-92. Blake, J., Sescu, A., Thompson, D. and Hattori, Y. (2018) A Coupled LES/Stochastic Modeling Approach to Jet Noise Prediction, AIAA Paper 2018-1248, AIAA Scitech Forum, Kissimmee, FL. Haywood, J.S., Sescu, A., Bhushan, S., Foster, J. and Farthing, M. (2018) Towards a More Realistic Triple Hill's Vortex Synthetic Method for LES of Wall Bounded Flows, AIAA Paper 2018-0837 , AIAA Scitech Forum, Kissimmee, FL.